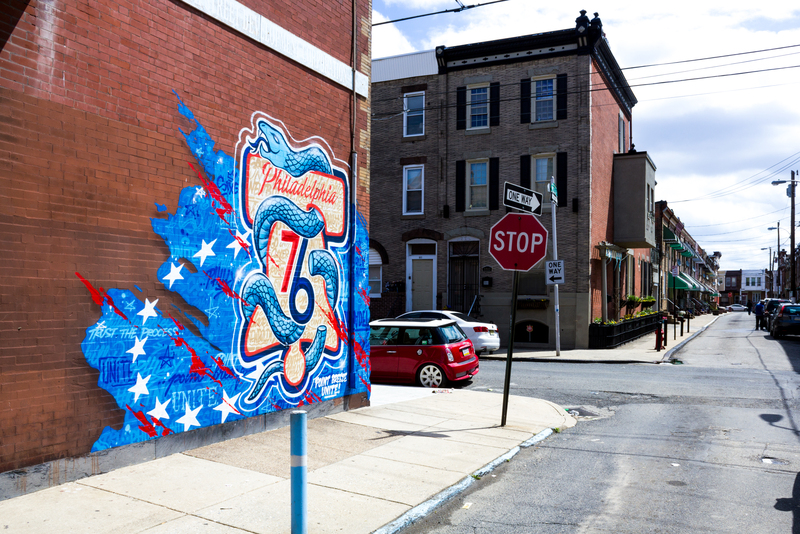 If you live in Philly, chances are you may have noticed a new series of neighborhood-rallying Sixers‘ murals that have been popping up around town. 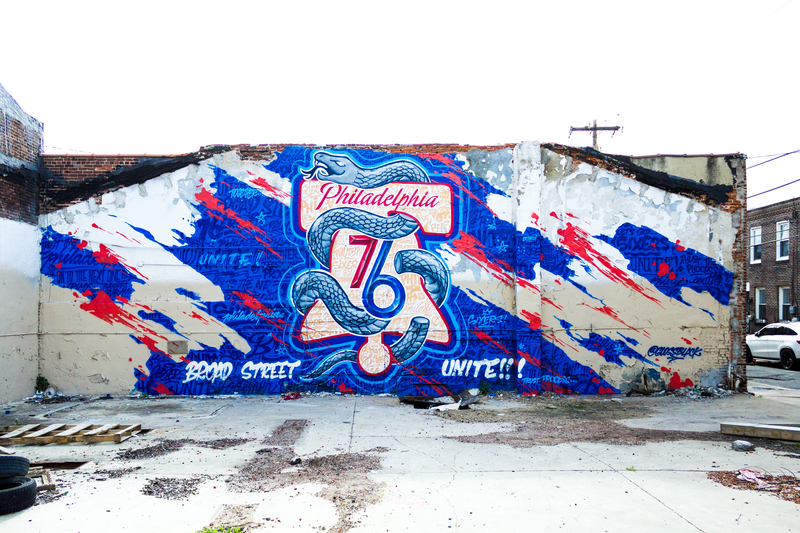 These ‘Phila Unite’ murals are the work of Philly-based graffiti and mural legend Glossblack, who with the help of fellow artist/muralist Evan Lovett painted his eighth mural in the series over this past weekend off South Broad street! 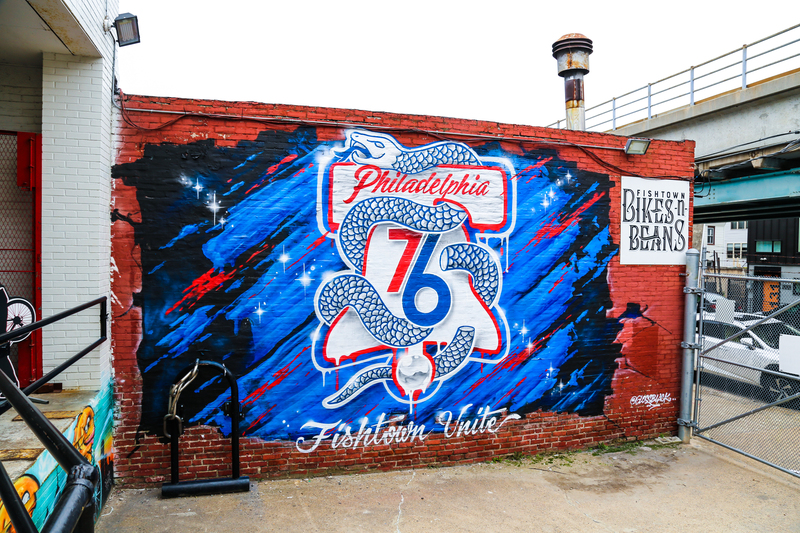 Now I know the Sixers are playing a make-or-break game tonight (so who knows where we’ll be by the time you read this,) but what I also know is that Philly has been LOVING these murals and posting about them all over Instagram. 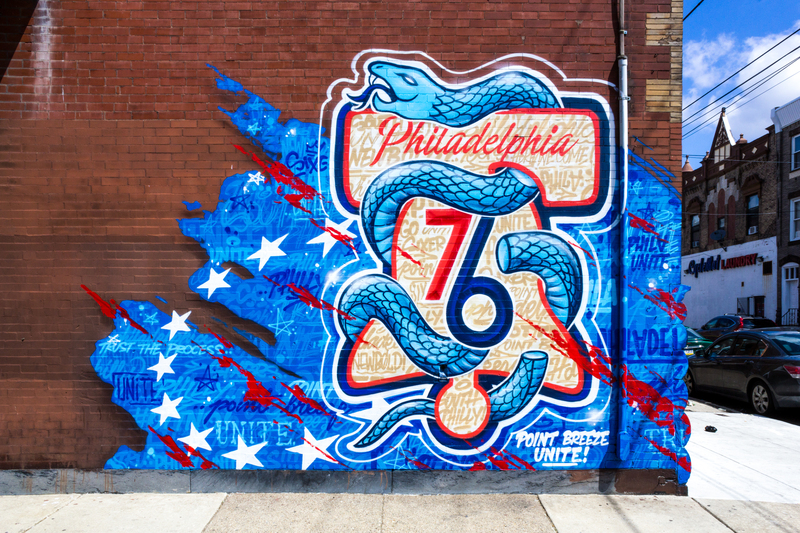 And in fact, the way they have been created makes them look and feel so much like neighborhood/Philly pride murals that I think they could easily last and be relevant between Sixers’ seasons or otherwise. 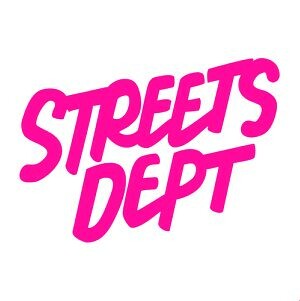 Streets Dept (Conrad Benner): First, I’m curious how you got involved with the 76s? Are you a basketball fan, have you been following this season? 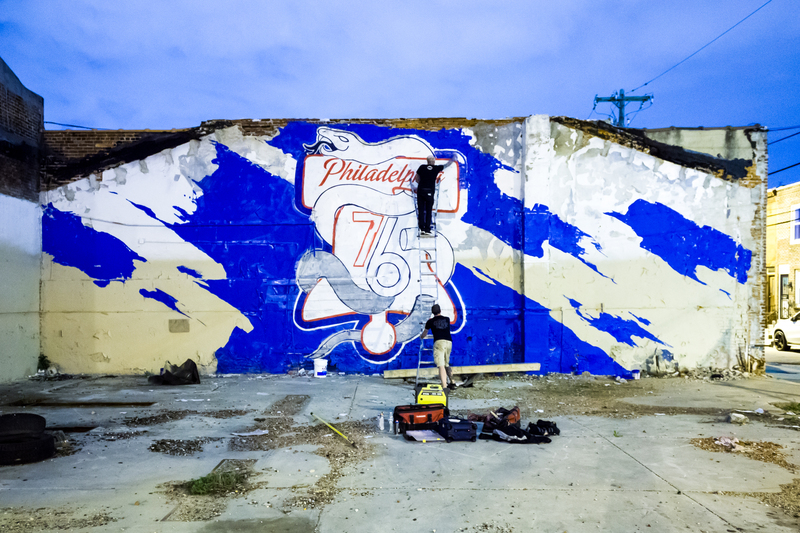 Glossblack: The first job I did for the 76ers was in 2015, where I painted a mural for the interview room called The Low Post. It was for their partnership with Redbull. 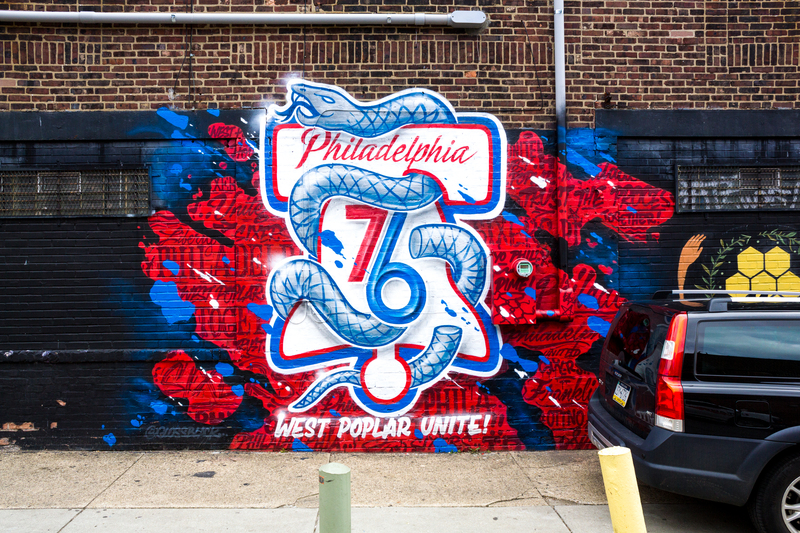 After that I did a few smaller jobs (custom basketball for auction, PHILA corn hole boards, etc) so when marketing came up with this neighborhood mural campaign I guess I was the obvious choice. I hate to say it but I don’t follow sports in general, but I’m definitely the dude that hops on the bandwagon when teams are doing well. SD: For those that might not know, why is this season (and how the team is doing right now) so special? GB: The last time I remember a buzz like this around the Sixers was the Iverson era. 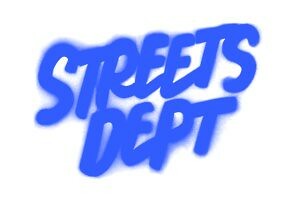 SD: Tell us about the design! I’m seeing it everywhere now, not just murals. Did you create it with the Sixers? GB: The design is the Sixers as their ‘playoff logo’. I did not create the design, a lot of people have assumed I was the designer, so all credit goes to their graphic designers. For the murals, I was graciously given a lot of artistic freedom to recreate or put my spin on the design. I was careful to keep the design as close to the original as possible but play with more backgrounds, text, shading and 3D, etc. Each location was different from the next, so I tried to place them in the space according to the type of wall. Originally, they wanted the design as-is stamped throughout the city. I was a little hesitant about that because I wanted them to look like a piece of art, and not plain stickers in each neighborhood. So as I mentioned, they kinda put the ‘ball in my court’ and let me run with it. SD: How’d the murals end up where they are? GB: A few weeks prior to painting the first mural, we were already planning out how to approach things. The 76ers obviously wanted to keep things a secret, so I just reached out to my followers to see if anyone had a wall they’d like to donate, for a ‘mural campaign’. I probably received about two dozen solid leads; some walls were great locations (the ones painted), some were in a less prominent location, some were too small, etc etc. So I made a list of the walls that were offered and luckily the top 7 were fairly spread out. 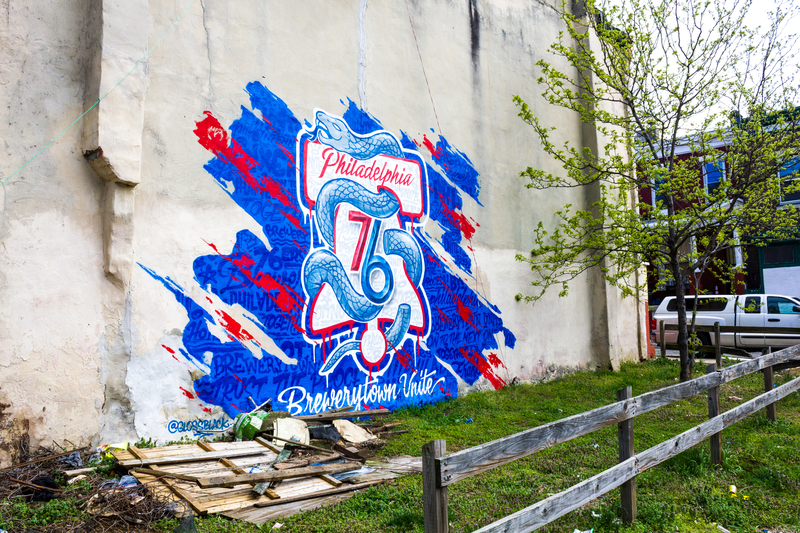 The 76ers wanted to represent each area of the city in order to bring all the neighborhoods together, so we went with our initial walls. SD: How long did it take to create each mural, and how long to get up the whole series? 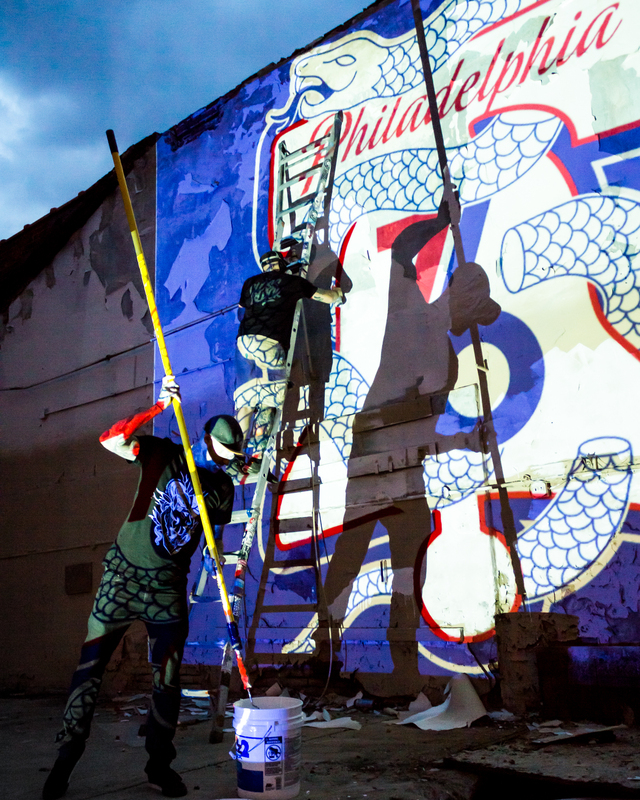 GB: Most nights we would start around 8pm and be finished and cleaning up by midnight, so roughly 4-5 hours per mural depending on size, location, and details. We painted 6 in a row, every night of the week, but we had a 7th planned that fell through. 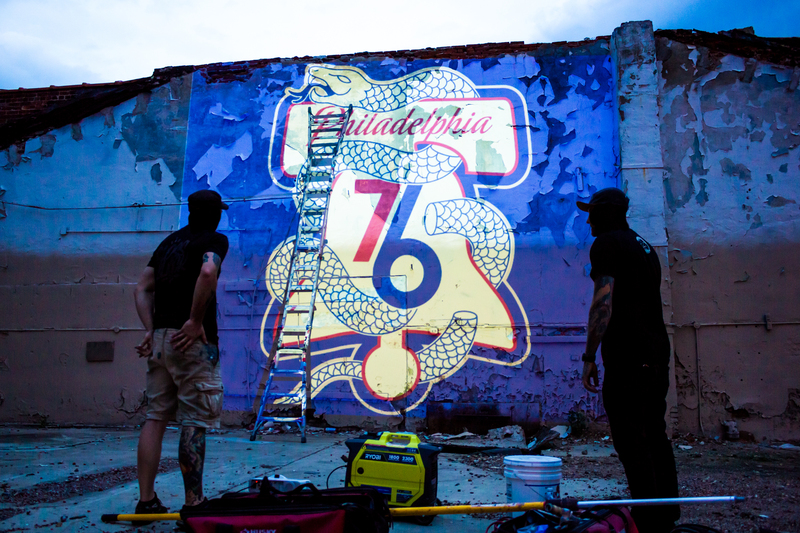 We took some time to find a replacement and then my friends at Urban Art Gallery agreed to host the 7th mural. So it was was 7 mural in 7 days, not including my days off. Thanks so much to Glossblack for the interview, and for the Sixers for supporting local artists!